The control of fire was the first and perhaps greatest of humanity’s steps towards a life-enhancing technology. Percussion methods of fire-lighting date back to Paleolithic times, when some Stone Age tool-makers discovered that chipping flints produced sparks. The technique became more efficient after the discovery of iron, about 5000 years ago In Arctic North America, the Eskimos produced a slow-burning spark by striking quartz against iron pyrites, a compound that contains sulphur. The Chinese lit their fires by striking porcelain with bamboo. In Europe, the combination of steel, flint and tinder remained the main method of fire-lighting until the mid 19th century. Fire-lighting was revolutionised by the discovery of phosphorus, isolated in 1669 by a German alchemist trying to transmute silver into gold. Impressed by the element’s combustibility, several 17th century chemists used it to manufacture fire-lighting devices, but the results were dangerously inflammable. With phosphorus costing the equivalent of several hundred pounds per ounce, the first matches were expensive. The quest for a practical match really began after 1781 when a group of French chemists came up with the Phosphoric Candle or Ethereal Match, a sealed glass tube containing a twist of paper tipped with phosphorus. When the tube was broken, air rushed in, causing the phosphorus to self-combust. An even more hazardous device, popular in America, was the Instantaneous Light Box — a bottle filled with sulphuric acid into which splints treated with chemicals were dipped. 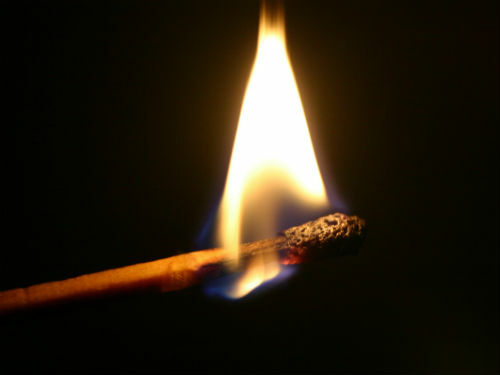 Other American innovations include an anti-after-glow solution to prevent the match from smouldering after it has been blown out; and the waterproof match, which lights after eight hours in water. They tried to 1 chancedespiteEskimosfrictionheatingheavenlylackingmakeMexicanspercussionpreserverandomrealisingrotatingsmokesunlightsurprisedunawareuntilwithout burning logs or charcoal 2 chancedespiteEskimosfrictionheatingheavenlylackingmakeMexicanspercussionpreserverandomrealisingrotatingsmokesunlightsurprisedunawareuntilwithout that they could create fire themselves. The very first fire-lighting methods involved the creation of 4 chancedespiteEskimosfrictionheatingheavenlylackingmakeMexicanspercussionpreserverandomrealisingrotatingsmokesunlightsurprisedunawareuntilwithout by, for example, rapidly 5 chancedespiteEskimosfrictionheatingheavenlylackingmakeMexicanspercussionpreserverandomrealisingrotatingsmokesunlightsurprisedunawareuntilwithout a wooden stick in a round hole. The use of 6 chancedespiteEskimosfrictionheatingheavenlylackingmakeMexicanspercussionpreserverandomrealisingrotatingsmokesunlightsurprisedunawareuntilwithout or persistent chipping was also widespread in Europe and among other peoples such as the Chinese and 7 chancedespiteEskimosfrictionheatingheavenlylackingmakeMexicanspercussionpreserverandomrealisingrotatingsmokesunlightsurprisedunawareuntilwithout . European practice of this method continued until the 1850s 8 chancedespiteEskimosfrictionheatingheavenlylackingmakeMexicanspercussionpreserverandomrealisingrotatingsmokesunlightsurprisedunawareuntilwithout the discovery of phosphorus some years earlier. Look at the following notes that have been made about the matches described in Reading Passage. Decide which type of match (A-H) corresponds with each description and write your answers in boxes 9-15 on your answer sheet. NB There are more matches than descriptions so you will not use them all. You may use any match more than once.